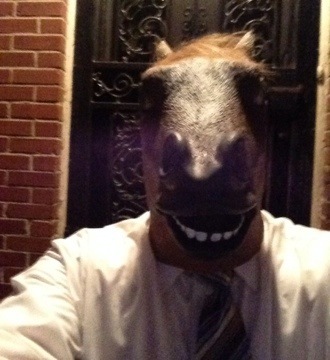 Not getting a lot of Trick-Or-Treaters coming up to the porch tonight. Hahaha it is raining HARD and I've had more Trick-or-Treaters this year than I've ever had. It's getting dire. If another big group comes by, I'll have to duck out to Target to get more candy. Either that or I'll just send them to your house, Basil. That ok? Almost looks like Piers Morgan but it's the wrong end of the horse. Show them the Obama end of the horse if you really want to scare them off. i've had none this year. i blame the the wind, the rain and the tornado watch. YOu trick or treated the John Kerry Household? What is Sarah Jessica Parker up to these days?